These sleek wedges are tailored yet lady-like, making it the perfect shoe for the season's hottest looks. Canvas upper with contrast leather trim. T-strap detail. Adjustable buckle on ankle strap. 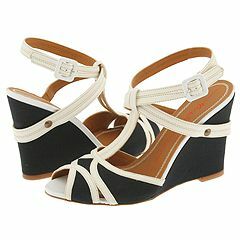 Covered wedge with strap detail on back of heel. Leather sole. Made in Italy.